Bolduc Leroux offers the plasma and oxycutting of steel plates, we can cut up to 12 inches thick over 80 feet long. 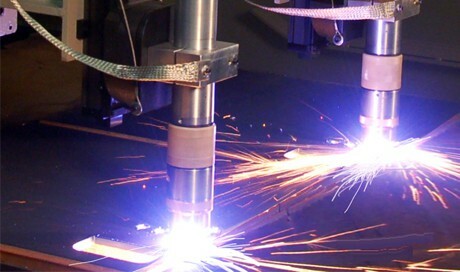 Our dual-head, 5-axis, robotic HD Plasma Cutting Table offers precision and flexibility that allows complex angled bevel cuts, including cutting of pipes up to 24 inches in diameters, all with rapid production. Contact us at 450 477-3413 or get a quote at the bottom of the page. New 80-feet long, dual rotary heads, 5-axis, MESSER HD plasma cutting table.